LOS ANGELES—To support his musical habit and pay the bills, for 20 years among other day jobs composer Philip Glass was a cab driver in New York City. But being a hack finally paid off in 1980: The Glass ceiling was shattered when Satyagraha burst upon the Schouwburg’s stage in Rotterdam, Holland. There’s a tendency to look down on opera as a centuries-old art form that’s an outdated medium for old maids, stuffed shirts and all-around fuddy-duddies. But Glass’s revolutionary Satyagraha gives the lie to that clichéd canard. Through mesmerizing music, magisterial stagemanship, surreal scenery, radical politics and more, this three-act, three-hour-plus operatic extravaganza about Mohandas K. Gandhi’s struggle for social justice is a tour de force. The title role is performed by tenor Sean Panikkar, Pennsylvania-born son of immigrants from Sri Lanka. Glass’s activist opera—which premiered while apartheid was still in effect and Nelson Mandela was cooling his heels behind bars at Robben Island—is actually set in South Africa, not India, where Gandhi eventually helped lead the independence movement against Great Britain. When the young Indian attorney, who was born October 2, 1869, in Porbandar, India, arrived in British-ruled South Africa in the 1890s, he encountered stunning prejudice and became a civil rights leader. Some of these tableaux of bigotry—which aren’t depicted chronologically in Satyagraha—are highly stylized and reminiscent of mass action mise-en-scène in early Soviet silent films. In Bhagavad Gita, Prince Arjuna (baritone Michael J. Hawk) and charioteer Krishna (a major deity in the Hindu pantheon of polytheism portrayed by bass-baritone Patrick Blackwell), who are depicted onstage in Act I, Scene 1, are riding off to war. 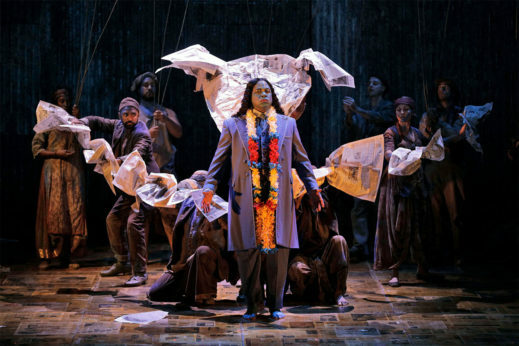 Arjuna, an archer who is a sort of Hindu counterpart to William Tell or Robin Hood, has second thoughts about war and violence, and the opera shows the impact all of this has on Gandhi. Given the fact that Glass’s opera is marinated in Hindu culture and sung entirely in Sanskrit—the composer extensively traveled to the subcontinent after working with renowned sitar player Ravi Shankar in 1965—plus the paucity of English supertitles, I suggest that LA Opera-goers read the synopsis plus “Who’s Who” delineation of Satyagraha’s characters in the excellent Performances Magazine, that playbill given free to all ticket buyers. 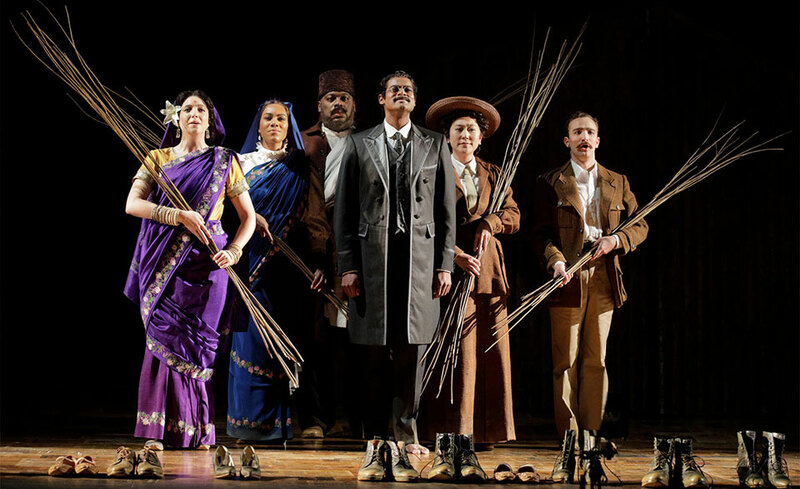 This will help audience members, especially those who don’t speak Sanskrit and who are unfamiliar with Indian culture, religion and history, to avoid confusion and better understand Glass’s complex ode to Gandhi. Attending the pre-performance lecture one hour before curtain, which is also included with the price of admission, can also be highly elucidating. Steeped in morality, thematically and stylistically Satyagraha also has elements of early Christian mystery plays which spread the good word during the Middle Ages, although here Glass is dispensing the gospel according to Gandhi. The Sanskrit word satyagraha refers to a “truth force” that can empower and ennoble resistance movements against evils (such as Trumpism) in the heroic crusade for social justice. It is a concept we could do more with now. Conductor Grant Gershon, director Phelim McDermott (ironically, he’s English!) and costume designer Kevin Pollard do yeoman work in bringing this spectacle to the stage, with its cast of dozens. There is some puppetry provided by another Englishman, Rob Thirtle, and 59 Productions renders the video design. In particular, if I was wearing a hat I’d take it off to scenery designer Julian Crouch, for his extremely imaginative, even visionary sets, which some of the performers literally fly across in some of the live stage’s best aeronautics since Mary Martin blasted off in her Tony-winning role as the boy who refused to grow up in the 1954 Broadway production of Peter Pan. As for the ensemble, “culturally correct” critics might find some of the casting to be eyebrow-raising. Bass Morris Robinson—an African American from Atlanta, who played the Turk Osmin in LA Opera’s 2017 production of Mozart’s The Abduction from the Seraglio; the Italian Sparafucile in their 2018 production of Verdi’s Rigoletto; and the Grand Inquisitor in the 2018 production of Verdi’s Don Carlo—portrays Parsi Rustomji, an Indian who migrated to South Africa, where he became a backer of Gandhi. Similarly, South Korean soprano So Young Park and Chinese mezzo-soprano Niru Liu both depict Caucasian women, respectively, Muscovite Miss Schlesen (Gandhi’s secretary) and Englishwoman Mrs. Jane Alexander, who bravely rescued Gandhi from a Caucasian mob that viciously assaulted him. And so on. This is not to be an ethnic nitpicker and to say that this cross-cultural, nontraditional casting is wrong: After all, Mary Martin was a female renowned for playing the male Peter Pan. And acting is largely about pretending. But ethnic authenticity in casting is an important issue nowadays and deserves to be discussed, considered and pondered. For instance, the “new” Orson Welles movie just coming out, The Other Side of the Wind, is full of racial (and sexual) anachronisms. 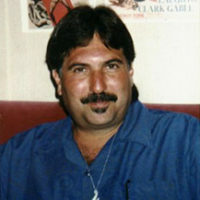 Oja Kodar (who also shares writing credits for this film finally “finished” and being released 40-plus years after it was shot) portrays a character called “Actress,” a highly sexualized woman archaically referred to as a “Red Indian” and most unfortunately in a bit of bad timing—considering the recent Elizabeth Warren DNA brouhaha—as “Pocahontas.” In fact, Kodar is from near Zagreb, Croatia, in what was at the time Yugoslavia, and apparently doesn’t have a single drop of indigenous blood. Yet she plays a role Native Americans may consider to be redolent with sexual stereotypes of tribal women. Representational standards change over time. In the opera house, roles call for very specific voice types and there simply are not enough appropriately trained performers for every role that composers write. Another value, not opposing but complementary, is that of giving accomplished singers from formerly excluded categories the chance to prove their artistic mettle in roles formerly reserved for Caucasians only. To be sure, Glass’s Gandhi has grandeur, but setting aside the subject of unconventional casting, this does not mean his operatic near-masterpiece is without flaws. Gandhi’s record in South Africa is not without blemish and always worthy of the honorific “Mahatma,” which can be translated as “venerable one” or “great soul.” While he organized non-indigenous Indian migrant laborers, some consider Gandhi to have been racist against African natives. It is outside the scope of this review to argue the historical merits of this argument, but Glass’s elegiac opera completely overlooks Gandhi’s purported racism against Blacks and in doing so arguably does a disservice to the cause of liberation. To compound matters, like the actors portraying the opera’s other “guardian spirits”—Leo Tolstoy in Act I and Act II’s Indian poet Rabindranath Tagore—Martin Luther King Jr. is entirely silent throughout Act III. With his back facing the audience, a mute Martin is viewed on high at a podium gesticulating, as he delivers his world famous “I Have a Dream” speech during 1963’s March on Washington for Jobs and Freedom. Tolstoy and Tagore—who won the Nobel Prize for Literature in 1913—are best known for their writing. While Dr. King, too, was an author, I daresay in terms of modes of communication, he was best known as an orator. Although King is commonly considered to be an acolyte of Gandhi as “the guiding light of our technique of non-violent social change,” to render this renowned speechmaker silent seemed tone deaf on Glass’ part. Furthermore, a strong case can be made against the kind of passive resistance and civil disobedience Gandhi and King practiced in favor of more militant means of self-defense and struggle. But again, this debate is beyond the scope of an opera review. However, these points bear being brought up, especially given the fact that Satyagraha is an explicitly political opera. Nevertheless, despite these misgivings and concerns, with its sublime sonic sensibility Satyagraha is at the top of the list of operas I’ve ever been fortunate enough to see. It is majestic, moving, a sheer exultation and exaltation of the human spirit through music, movement, acting and sets, and of a movement against injustice and for equality. Seeing/hearing Satyagraha is truly a spiritual experience. We can never get enough of these. 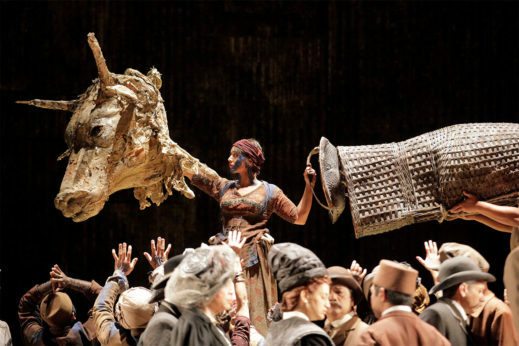 With this opera Glass has given us one of the art form’s immortal greats— indeed this LA Opera production surpasses its 2013 Einstein at the Beach and the Egyptian-themed 2016 Akhnaten, which were both stellar versions of the composer’s trilogy of heroic operas. With Satyagraha Philip Glass transports us to the higher realms of cosmic consciousness. It’s a lot more enlightening to ride in one of Krishna’s chariots than in a yellow cab. Remaining performances of Satyagraha are Thurs., Nov. 8 at 7:30 pm and Sun., Nov. 4 at 2:00 pm, at the Dorothy Chandler Pavilion, 135 N. Grand Ave., Los Angeles 90012. For tickets and other information see the LA Opera webpage here.